The Danny O'Brien-trained Star Witness heads a contingent of four Australian entries for the Royal Ascot meeting in June. Dual Group One winner Star Witness, the David Hayes-trained Eagle Falls and Mark Kavanagh's Shrapnel, last-start winner of the Group Three Yallambee Classic, are entered for both the King's Stand Stakes (1000m) and the Golden Jubilee Stakes (1200m). The Peter Moody-trained Hinchinbrook, placed three times at Group One level, is nominated only for the Golden Jubilee. Eagle Falls, winner of the Group One Oakleigh Plate (1100m) at Caulfield in February, has already had international experience when running fifth to Kinsale King in the 2010 Golden Shaheen in Dubai and fifth to Green Birdie in the 2010 KrisFlyer Sprint in Singapore. Australian gallopers have a remarkable recent record in the feature sprints with Choisir, Takeover Target, Miss Andretti and Scenic Blast all successful at Royal Ascot in the last decade. Caulfield Guineas winner Starspangledbanner won last year's Golden Jubilee Stakes for leading Irish trainer Aiden O'Brien. Among the Irish entries for Ascot is the former Bart Cummings-trained star So You Think, now with O'Brien. The dual Cox Plate winner is nominated for the Queen Anne Stakes and the Prince of Wales' Stakes. If So You Think runs in the Queen Anne Stakes he will be out to emulate 2007 George Ryder Stakes and Doncaster Handicap winner Haradasun who won the race in 2008 when prepared by O'Brien. 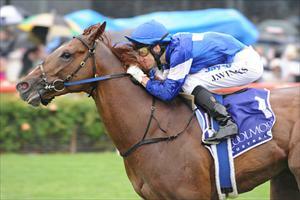 Kidnapped, the 2010 South Australian Derby winner, has been entered for the Ascot Gold Cup. The 300th Royal Ascot carnival features seven Group One races and runs from June 14 to 18.